Did you know that every $1 spent in Google Adwords produces, on average, $2 in revenue? With our PPC campaigns at The Symphony Agency, we’ve had proven gains of 200 percent to well over 1000 percent return on our clients’ investments. Whether you’re looking for information on PPC, want to determine if a paid campaign is for you, or you’re just curious as to how we run PPC, you’ve come to the right place. PPC, which stands for Pay-Per-Click, is a model of internet marketing that most platforms use when allowing people to advertise on their properties. It’s commonly associated with search engines (think Google Ads and Microsoft Bing), but it’s also used with social media giants Facebook, Twitter, Instagram and many other entities. Search engine advertising is one of the more popular forms of PPC, which allows advertisers to pay a fee each time one of their text ads are clicked. The amount that’s paid depends on many variables — mainly bid price and quality scores — which we’ll review later on. Where do text ads show up? With Google, text ads used to be displayed above and below the search results, and on the sidebar of search ads. As you can see, Google carves out a large space on their search results page to display ads. Clicks on paid search listings top organic clicks by nearly a 2:1 margin. Moreover, 64.6 percent of clicks on Google are in the form of ads when a consumer is looking to buy an item. While organic ranking is important and provides a consistent source of free traffic, a digital marketing campaign can be grown exponentially when paid ads are incorporated. With a 64 percent search market share for U.S. desktop traffic and 89 percent of mobile organic traffic share being in Google’s corner, it’s important to be somewhat familiar with this. Let’s review how the Google Ads platform works and how it can be beneficial to you. Google Ads uses an auction system to display ads on it’s search results page. Each time a keyword is input and a search is conducted, Google digs through a supply of bidding advertisers and picks a set of winners to appear above and below organic rankings on its search page. As we went over above, each time the advertisers’ ad is clicked, they’re charged a certain fee. How much do I pay and how are my ads shown, you ask? That’s simple….just kidding. How does Google pick the winning ads? Ad positions are how Google determines its winners. These ad positions are displayed on the Google Ads dashboard, so it allows us to adjust this position. The ad winners are chosen on a combination of factors. Most of all, quality, relevance of their keywords, ad text and bid price. 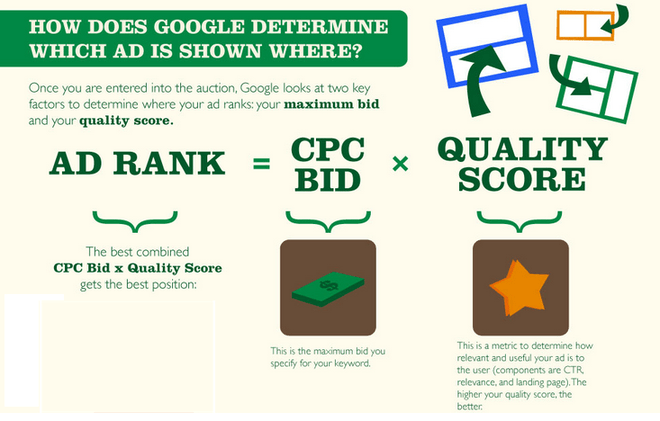 Search Engine Land provides a great infographic on how AdRank determines the position of your ad. Basically, your highest bid price is multiplied by your quality score to place your ad into a position. At Symphony, we like to keep our ads around 1-3 as a client’s keyword competition and budget dictate how aggressive we can be. Now with competition, AdRank proves to play a huge role in determining the actual cost that you pay per click. The cost that you actually pay when someone clicks your ad is based on the above formula. Seeing as how this is a bit confusing, we’ve attached an example of 4 advertisers bidding on a keyword and how it converts to their ad rank. This shows the importance of quality scores and why they should be kept as high as possible. While bid price plays an important role, quality score plays an equally important role in displaying an ad. These formulas Google uses allow for advertisers to provide quality content over throwing massive budgets at keywords, resulting in more legitimate competition. With that brief overview of Google Ads, it’s now time to determine if it’s the right solution for your business. Is Google PPC for you? From our experience at Symphony, we’ve always found it to be beneficial to have a paid campaign presence. For example, if you pay $20 for a click, but the click resulted in a $300 sale, then using PPC makes complete sense. The underlying issue is that if a certain keyword is $200 for a click, the budget that you’ve allocated for a paid campaign may not suffice. Which brings to light another factor, whether it’s financially feasible. It’s always recommended that you conduct research on how much your competition is spending to have their ads displayed. Back to the Main Question: Is this for you? Unfortunately, the answer isn’t incredibly clear. It comes down to an evaluation of budget, competition and industry. That being said, we’ll wrap this up with a few stats to help provide some more clarity.